Several turnpike companies were chartered to build macadamized (compacted broken stone) roads connecting Cincinnati to Dayton. One of these was the Great Miami Turnpike, constructed in 1840, which was later known as Cincinnati-Dayton Pike, Dixie Highway, U.S. Route 25 and South Dixie Drive. The dirt road traveled by foot, horse, wagon or stagecoach was eventually paved with macadam, concrete or brick. The road has always been one of southwest Ohio’s major north-south roads. A stage line was established between Columbus, Dayton and Cincinnati, making travel to Cincinnati from Dayton by passenger coach available. The service was weekly, and the trip took a mere 24 hours, with an overnight stay in Hamilton, Ohio. The fare: 8 cents a mile including a 14-pound luggage allowance. A famous photo taken in 1914 just south of West Carrolton features the turnpike as it shows the five forms of transportation at one time – Miami-Erie Canal, Great Miami River, interurban traction line, railroad line and a Model T auto on the turnpike. The 1922 AAA Automobile Blue Book claims “the shortest and best route from Dayton to Cincinnati is via the Dixie Highway”. 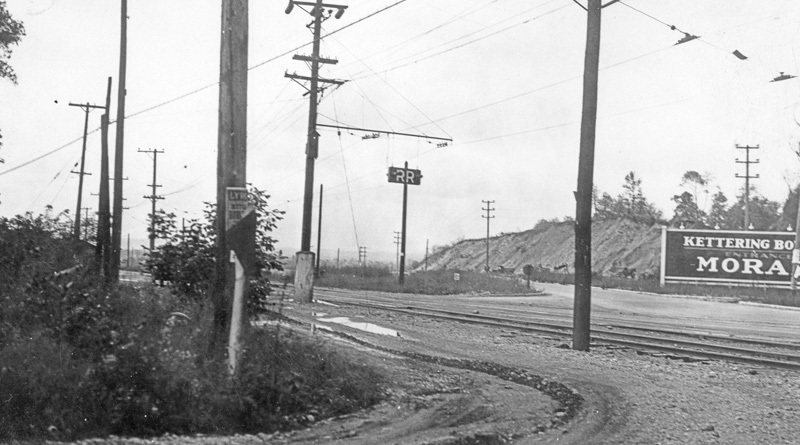 The Cincinnati-Dayton Pike was two way traffic for almost one hundred years as Kettering Blvd from Dorothy Lane to southern Moraine was not built until 1928. During World War II when Frigidaire switched from producing refrigerators and began wartime production of airplane parts, bullets and machine guns, Dixie Highway in Moraine received additional lanes and an extension due the heavy volume of truck traffic shipping war supplies. Traces of the original turnpike have surfaced from time to time. The old brick pavement was uncovered under southbound Central Avenue in West Carrollton near the former Roberds Appliance Store and again while the new I-75 Exit 48 ramps were being excavated. Additional remains of the original brick paved highway were uncovered by City of Moraine employees under the railroad overpass in December 2015 (see July 2016 edition of the Moraine Messenger). The original brick road is solid and measures 16’11” wide, large enough for horse & buggy and eventually automobiles to pass safely in each direction. The Historical Marker location is at 4100 South Dixie Drive at the park just south of C.F. Holliday Elementary School.